created to help children of all ages around the world. Our Mission is to collect donated quilts and distribute them to children around the world, so they can be wrapped in love and comfort. As we all know, a quilt is a very special thing. 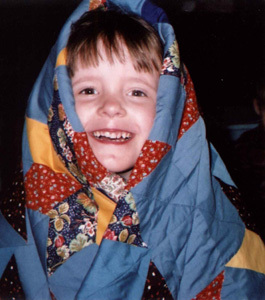 It isn't just a blanket; it has been lovingly created by a real person. A quilter leaves a part of themselves in every quilt they make. The child who receives it will be able to snuggle up in all the love and comfort that comes in that quilt. Read about how Wrap Them in Love started. 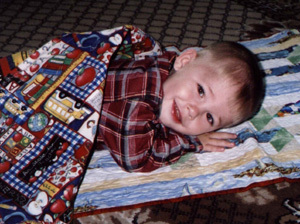 Make a donation to help us to provide more children with quilts. 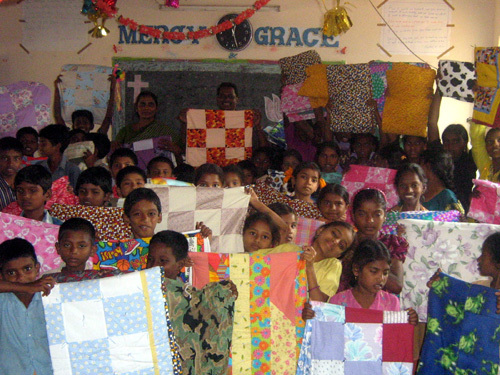 Quilts made and donated by children. See all of the beautiful quilts! A place to honor some very special people. Find out how you can donate a quilt even if you don't sew! 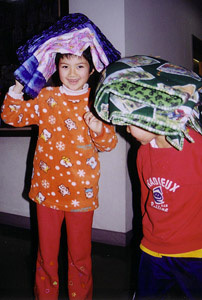 Here are some of the children around the world who have received Wrap Them in Love quilts. Wrap'em Quilting Bees!Quilters from all over the world help make quilts. Thank you to everyone who has sent quilts or blocks to us for the children. The quilts are beautiful and will be well loved by the children who will receive them. Thank you to all of you who have helped us in so many other ways from quilting, to delivering quilts and everything inbetween - including those who encourage us and support our efforts. Check out our Wrap Them in Love Blog to see the latest Wrap'em news. 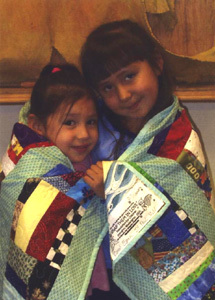 Wrap Them in Love quilts go to children locally as well as world wide. Requests are always coming in for more quilts, and we need your help so that we don't ever have to turn anyone down. You are not only bringing warmth to a child, but much needed hugs and love as they snuggle in your quilt. Don't forget to check out the galleries from this year as well as the previous years. 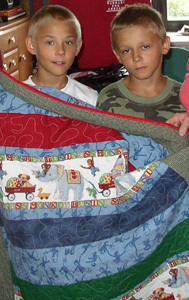 With the economy as it is and the cold winter, we have had more requests for quilts than ever. We have recently received some quilts that are classroom projects. What a great project for kids of any age---kids helping kids! We really appreciate all of the hard work of the students as well as the adults that help out in these projects. When there is a tragedy or disaster, often we want to help but just don't know what to do. Making a quilt for a little one will help the child in need, but it is also a way that we, as quilters, can feel like we are actually doing something to be of help. Wrap Them in Love quilts go to children all over the world, from local food banks and shelters, hospitals, to orphanages, to soldiers and earthquake, hurricane and tidal wave, mudslide and fire victims. USA Please be sure to put your return address written clearly on the box and put a paper with "TO" and "FROM" information inside the package. We don't want to take the chance of a quilt getting lost along the way. Remember these quilts will be used and laundered a lot. Tie or quilt them fairly close so that they can hold up to lots of loving. We recommend about 42" X 60", but you can make them any size. There are older children as well as babies who need them. Several times we have been asked for larger quilts for teenagers. Children come in all sizes, so whatever size you choose to make will be great! Gather your friends, club or quilt group, your classroom, your church and make quilts together. If you'd like to, put a label on each quilt that includes your name, where you are from, and the date you made the quilt. You can help by getting together with friends to quilt for Wrap'em, or quilt at home on your own. If you want to help, but can't send a finished quilt, you can send blocks or quilt tops---or even fabric or batting. If you send even one block, be assured that it will go into a quilt that will be given to a needy child. We will document every quilt with a picture. Visit our Galleries to view quilts that have been donated. It's a great place to get ideas for your next quilt or just to relax and enjoy the beautiful quilts.